Every now and again, a person comes along whose life truly exudes the compassion and love of Christ. One such woman was Carrie Steele. An orphaned child herself, and born into slavery, Steele knew what it was like to feel the pain of abandonment, and gave her life to being a mother to unwanted children. In addition to this, she has left a legacy as a key figure in the fight toward race equality. Steele’s work of caring for the defenseless began while working as a maid for Atlanta’s Union railroad station. She would often find abandoned children left at the train station, and proceed to take these children to her small home and care for them. Over time, her own capacity to care for the number of children she had taken in became stretched, and she began laboring toward the building of an establishment for the children. She worked tirelessly and used various means to raise funds in order to build an orphan home, including the writing and promotion of her own autobiography, fundraising in the community, and finally, the selling of her own home. At last, the woman who made $100 per month working for the railroad station managed to gather the $5,000 needed to construct her orphan home, and it was dedicated in 1892. The passion for these children ran beyond simply pulling them off the street, but bled into what we call Wholistic Care. She recognized that without the proper care, these orphans would end up no better off than at the first. As someone who had served as a volunteer probation officer, she understood that orphans were prone to fall into lives of crime, and in the effort to prevent this, she structured the home in such a way as to care for all of a child’s needs and prepare them for a successful life ahead. Steele was not only a notable figure in orphan history, but in the civil rights movement as well. She was fighting for young boys and girls of color when racial tensions were still extremely prevalent. This home would become a significant help for those underprivileged children who would fall prey to the highest level of discrimination and marginalization. Steele was truly helping the most helpless & outcast ones, and thus served in the ultimate sense to advance the cause of racial equality as well. Carrie Steele Logan (her married name) developed a high acclaim and appreciation within the society of Atlanta, Georgia. Many in the community, including the local police force affectionately named her “aunt Carrie.” Her gravestone is inscribed with the phrase: “The Mother of Orphans. She has done what she could.” The labor of this woman who poured her life out for the defenseless has not been forgotten by those affected by her life, and, chiefly, by our heavenly “Father to the fatherless”. By David Martin | Communications Specialist Every other month, staff member David Martin will share his research about men and women who have cared for orphans in various ways. We are inspired by the lives of believers from the past, and seek to learn from both their models and mistakes. Lean into this blog as David shares about preacher George Whitefield and his orphan-care model. If scripture’s multitude of passages on the subject didn’t seem sufficient to convince that our God carries a deep, rich, and passionate love for the orphan, then a glimpse into the history of the church ought to win you over. Men and women, carrying in themselves a fervent love for our Lord, for the gospel, for the kingdom - find in themselves a compelling drive to provide for the orphan and widow. We see something of this heart in the life of the early church when we see in Paul’s letter to the Galatians that Peter’s only request to him was to “remember the poor” - “the very thing I was eager to do” (Gal. 2:10). We can see this as well in the lives of many throughout church history. One of the preeminent examples from recent centuries would be that of the old preacher George Whitefield. Most remember Whitefield for his contribution to the American Great Awakening, which swept across the American Colonies during the 1930s and 40s. Some call to mind his association and friendship with other prominent preachers and religious figures of the day, including Jonathan Edwards and the Wesley brothers. Some have heard stories of his oratory skill and open air preaching ministry, of which Benjamin Franklin calculated over thirty thousand people could hear him at once. Some, however, remember that less-often talked about, but massively important labor, of Whitefield’s life: the Bethesda Orphanage. Whitefield, who lived from 1714 to 1770, first visited the colony of Georgia on May 7, 1738. His stay was short, and he left the US in August of 1738, just a few months later. By that time he was fully convinced of the need to construct the orphanage and lost no time in beginning to fundraise in England for the purpose of establishing an orphanage. “Though the children are taught to labor for the meat that perisheth, yet they are continually reminded to seek first the kingdom of God and His righteousness, and then to depend upon God’s blessing on their honest endeavors for having food and raiment added unto them. … As my design in founding the Orphan House was to build up souls for God, I endeavor to preach most of all to the children’s hearts… that they may be able to give a reason of the hope that is in them…"
His desire was to first and foremost care for the children’s spiritual needs, that that they would be grounded in the gospel; but he also ensured that they learned vocational skills so as to prepare them for a seamless transition into a successful life after leaving the orphan home. This was, indeed, a vision for “wholistic care”. He desired to not simply keep the children off the street, but to invest in their future for the sake of the children themselves, and also recognizing they were the future of society. Whitefield had as part of the grand plan the establishment of a college to run alongside the orphanage. In his petition to start the college, he stated that his desire was “to make the Orphan House not only a receptacle for the fatherless children, but also a place of literature and academical studies.” The College never successfully came to fruition during his lifetime, but it nonetheless gives us a further glimpse into his long-term desire and heart for the orphanage. Whitefield was not a perfect man by any means, nor was this orphan home a perfect demonstration of care for the fatherless, but it was beneficial and inspirational to many. Orphan care has changed drastically throughout the years, but thanks to individuals like Whitefield, we are given examples from which to learn. This preacher, who cared more than anything for the preaching of the gospel, could not separate from his faith the responsibility to care for the orphan. It would seem that James 1:27 was truly beating in this man’s heart, and thus flowed out of his life. Oh that the Lord would give us more of these kinds of men and women in our day - those with a passion for the gospel, that includes being eager to “remember the poor”. Interact with us: what do you learn from Mr. Whitefield’s model? What would you do differently? Lean in today as Director of Church Partnerships, Sheri Mellema, takes us back in history to understanding the heartbeat of Amy Carmichael and her love for orphans. Every summer for as long as I can remember my daughter has challenged me to a tanning contest. Granted, I love being in the sun and I can tan with the best of them, but this particular competition is skewed from the get go. Although my dear girl sincerely pretends that I have a shot at winning, she knows in her heart that the proverbial prize is already hers. You see she is partially Hispanic and her skin is this rich, creamy, mocha brown that soaks up the sunshine. I, on the other hand, come from Eastern European descent and well…you get the picture! My daughter is a teenager now and typical of all teenage girls, she wants certain features of herself to be different. She happens to have curly hair so of course she straightens it. At the same time, her friends with straight hair spend hours trying to loop their hair with curls upon curls. Similarly, there was a very young girl in Ireland who in 1870 prayed and asked God for blue eyes rather than brown. Her exact words were, “But what I can never tell you properly is the bewilderment that even now I can remember as if it were yesterday…Without a shadow of doubt that my eyes would be blue in the morning I had gone to sleep, and the minute I woke I pushed a chair to the chest of drawers on which there was a looking-glass and climbed up full of eager expectation and saw-mere brown eyes.” Thank goodness the clear and decided answer from God was, “no”. For this tiny Irish girl was Amy Carmichael and untold doors would be opened to her because of those determined brown eyes! Undoubtedly Amy had no idea just how prophetic these words would become. While going to school and pursuing artistic endeavors, Amy noticed the poverty and embarrassment that surrounded many of the mill-girls that were known to those in the community as “shawlies”. They were called this because they had no means to buy proper hats and were forced to pull their shawls around their heads. It was Amy who felt that they should be welcomed into the Presbyterian Church that her family had always attended and she relentlessly pursued the minister until he agreed to allow her to invite the “shawlies” into the Church Hall every Sunday morning. The work with the mill-girls grew into a congregation of 500 and soon Amy would request and secure funding for a hall of their own. At the age of eighteen, Amy’s father contracted double pneumonia and was unable to recover. After his passing, everything changed as Amy and her mother struggled to make ends meet for themselves and the six other fatherless children in the family. Since Amy had already begun her ministry with the mill-girls, she now had many needs to be concerned with. And yet, her heart remained open to God’s still small voice. Amy and her family were introduced to Robert Wilson who was the cofounder of the Keswick Convention. He himself had suffered also as he had lost both his wife and a daughter. It was Wilson who introduced Amy to Hudson Taylor of the China Inland Mission and a well-known preacher named F. B. Meyer. Mr. Wilson was well liked by the Carmichael family and their visits continued. In fact, at some point they began to refer to him as “D.O.M.” which was their kind hearted acronym for “dear old man”. Eventually, Mr. Wilson became a significant mentor to Amy and requested that she come and live with him as a daughter since he now had only sons. After much consultation with her mother, Amy agreed and even after leaving Mr. Wilson for full time ministry, he was her ardent supporter until his death. As I reflected on Amy’s incredible willingness and bravery to leave her family and everything she knew to come alongside an elderly man who wanted the presence of a daughter in his life again, I was markedly impressed. My thoughts drifted back to one of the poems that Amy wrote. Her single-mindedness of purpose is striking. These words take my breath away! How is it possible that a girl at such a young age could have been so dedicated, so enraptured with loving God and loving others? What kind of a girl asks for the lack of fear to follow God into hard choices, lack of comfort, suffering and undeterred faith, hope, and passion? Further yet, what kind of a girl leaves her home not long after her own father has died, to comfort a different father? An extraordinary girl I would have to say! And I would venture a guess that she was seldom concerned with curly versus straight hair or tanning. Coming from a beauty clamoring society like ours, that’s a hard pill to swallow. As a matter of fact, the only time that she was concerned with the color of her skin was when she finally arrived in the country that was to be her home for the rest of her life. After being rejected by the China Inland Mission for a form of neuralgia and then being sent home from a stint in Japan because of health issues, Amy came to reside in India. This became her true home, the place that bestowed upon her the name of “Amma” which is the Indian word for “mother”. This was where she loved and served beloved Indian children! Initially, Amy was consumed with rescuing young girls who were destined to become temple prostitutes. It was not uncommon for Hindu parents to take their beautiful young girls or even infant girls to be offered as “gifts” to the Indian gods. The tragic truth is that they were then groomed to become dancers, singers, and prostitutes for the temple priests. Eventually after several years passed, Amy also provided a haven for the many boys who were born as a result of the temple practices. And this is exactly when Amy Carmichael’s brown eyes became a bright gift from Heaven. Amy’s biographer Frank Houghton writes, “But in India it is a distinct advantage to have brown eyes, for blue eyes are foreign, and therefore to be remarked upon. ‘I know why God gave Amma brown eyes,’ said one of her boys. When she was discovering the facts about the temple children, she used to stain her hands and arms with coffee, and visit places to which foreign women would never be admitted. Of course she wore Indian dress, but if her eyes had been blue someone might easily have penetrated the disguise.” So not only did her brown eyes become an asset but she also found a clever way to darken her skin so as to more closely resemble those around her. If only our current day efforts to change our looks were for such noble reasons. Ironically, it was Amy who was about to experience the storms and floods of life crashing into her yet again. On October 24, 1931 when she was sixty-four years old she prayed these words: “Do with me as Thou wilt. Do Anything, Lord, that will fit me to serve Thee and help my beloveds.” Later that day while inspecting a piece of property, Amy fell into an unmarked hole and suffered a broken leg, a dislocated ankle, and a twisted spine. These injuries would leave her mostly bedridden for the next twenty years of her life. In true “Amma” fashion she wisely used those years praying, writing letters and books, and training those who would serve after her. The attraction to be near her never waned. Both children and adults were drawn to her great love. Elizabeth Skoglund wrote the book “Amma” in which she says, “In truth it was God Himself in her Who was the attraction. But as Amma, she who was never married and had no biological children became mother to hundreds of children throughout the years and thus formed one of the greatest works in the history of the Christian Church.” Amy Carmichael truly left a legacy in caring for vulnerable children. What it is that stops us from such radical, devoted love? How does fear prevent us from making the “hard choices” rather than taking the easy way out? Do you ever have those days when you listen to the news and wonder how things can get any worse? At every turn there is barbarism, cruelty, injustice, and inhumane treatment. Here we are, these “enlightened” creatures living in the twenty-first century and you would think we would have progressed to standards of decency which procure respect and a certain level of compassion for every human on the planet. But clearly that is not the case. I think of the Syrian conflict and the thousands of refugees who are tortured by starvation and abuse, the nearly three hundred Nigerian girls kidnapped by the Boko Haram with virtually no hope of being found and rescued, the brutal tensions between the Ukrainian and Russian people, and over 153 million children who have no one to call mother and father. As I read I found myself gasping in disbelief! How could this possibly have been accepted as common practice? How could a human infant be discarded so easily and in such cruel fashion? But in fact, it was indeed common. So much so that the public places where infants were abandoned became known as “exposure walls.” It was routine and not at all alarming to walk by these walls and find unwanted babies. The selling of children was illegal during these years and without any communal support or options, parents and especially single parents, most likely became desperate. By the time the first Christian emperor Constantine came into power, he authorized the sale of infants. This change occurred in A.D. 313 about the time Christianity was gaining influence. Yes, I know, you are wondering how this proclamation is any more merciful! I had the same reaction. Well apparently, it was a tiny step in a more positive direction. “While selling one’s children seems horrible to us, the alternative had been death or slavery: in the one case, worse, and in the other, the same, so sale of infants offered some hope, especially since in Roman society some slaves could hope to buy their freedom. Even with legal permission to sell one’s offspring, exposure didn’t end overnight, but by about 374 it had been legally forbidden” (N. S. Gill, “Roman Exposure of Infants”). With the advent of the church I am glad to say that conditions for unwanted children slowly became better. 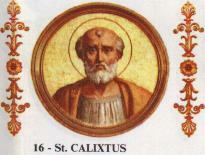 There were courageous people like Callistus of Rome who developed a passion for abandoned children. At great risk to himself he organized “Life Watches” at exposure walls where babies could be rescued and placed with Christian families. Callistus had himself been a slave in the late 2nd century, which probably explains his perseverance in sparing children from a similar fate. Similarly, Saint George Diospolis also known as the “dragon slayer” performed daring rescues of children in distress. His commitment to the vulnerable cost him his life. He fell victim to Diocletian in the Persecution of 304. By the Medieval Age there was an incredibly brave young girl who advocated especially for the unwanted mentally ill. She felt that there was no such thing as an unwanted child and that life must be protected. Sadly this young girl was murdered at the tender age of fifteen by her own father who despised her faith in God. She later became known as Saint Dymphna of Belgium and she is credited with the inspiration for a hospital and orphanage in Gheel, Belgium that is aiding children and adults to this very day. During the Middle Ages and in the 18th and 19th centuries, a new practice developed. Churches and eventually Christian missions and foundling homes provided a safe, anonymous way to care for abandoned children. The “foundling wheel,” as it was called, was an opening or flap in the outside wall of a building that opened to a soft warm bed inside where an infant could be placed and a bell could be rung to alert the caregivers that a baby had arrived. Near the end of the 19th century foundling wheels were no longer used and an updated version called a baby hatch took its place. Baby hatches have become more prevalent since 1952 and are currently used in many countries outside of the United States. They provide the opportunity for a mother or father to reclaim their child within a certain time period, they offer the prospect of adoption, and they give the option of life in countries where female infanticide is practiced. So after exploring “some old things” that perhaps we didn’t know, (many thanks to Solomon and Mr. Bierce) it seems wise to ask the second question. What happens today in our modern society when a child is born that is unwanted? As you know there are a myriad of answers and many of them depend on the location of where the question is being asked. There are still answers that reflect “nothing new under the sun” like abortion, slavery, infanticide, abandonment, and the selling of children. But thanks be to a miraculous God, there are also answers like adoption, supportive church communities, foster care being provided by faith-filled families, and birth parents being given the support and structure needed to raise their children. There is still courage and bravery where parents will dare to keep and raise their children in spite of political pressure and penalty. There are mercy-laden families within the global church who will take in a cousin, niece or nephew after catastrophe has struck. There are international churches that partner with western churches to provide home-based care for children without families. And best of all, there are no longer exposure walls. Certainly there is a lot of suffering in this world. And yes, it can be depressing to listen to the news on many days and unfortunately that will be the case until Eden is restored. But we are called to hope, courage, and love! We can say with confidence through the redeeming work of the cross that there is more opportunity for the restoration of orphans than ever before. Christ followers have always led the fight and we need to continue leading the fight today. One of my favorite quotes from John F. Kennedy is, “There are risks and costs to action. But they are far less than the long range risks of comfortable inaction.” I think humanity regresses when we mindlessly slide into inaction because of our affinity for ease. Please pray with me that we will bravely press forward for what we know to be true and right; that we will have courage like our Christian ancestors to protect and care for the orphaned and vulnerable children of this world. How has learning more about our history changed your perspective? In what ways are you taking action and maybe more importantly, in what ways have you become comfortable with inaction? Comment below! Recently I was reading an article that introduced me to the words gemilut chasidim. I have no idea how to pronounce these words and if you are like me, you are thinking that they look like a character’s name from the “Lord of the Rings” series. Hazarding a guess as to whether this character is good or evil, I think I would lean toward the dark side. Gemilut just sounds like a bad guy! In actuality these two words have quite a wonderful meaning and stem from an embedded Jewish tradition. They mean, “the bestowal of loving kindness” or “acts of compassion” according to the Jewish dictionary. The term was already in use by New Testament times, but the concept was drawn from the Israelites’ understanding of verses like Deut. 10:17-18: “For the Lord your God is God of gods and Lord of lords, the great God, mighty and awesome, who shows no partiality and accepts no bribes. He defends the cause of the orphan and the widow, and loves the stranger, giving him food and clothing”. Bratcher goes on to emphasize that, “The attitude behind charity for the needy was that all possessions, lands, and goods ultimately belonged to God.” I wonder during the course of each day how many times I forget that truth? My stuff has never ever really been my stuff! Every resource I have is actually on loan from a gracious God whose heart aches for those in this world who do not have adequate resources, care, and a sense of inclusion. I have a wise friend who has mentioned that money can serve as an insulator and an analgesic, in that wealth often removes the vulnerability that is necessary to reveal our utter dependence on God and it can numb us from the realities of suffering. Certainly money is not the only culprit when it comes to numbing ourselves to the needs around us. Work, entertainment, busy schedules, social media, and numerous other possibilities are also effective distractions. So what was it that captivated the hearts of the early Jewish people as they lived out acts of compassion? In our defense, they didn’t have the overwhelming distractions that we face in our day and age. Nonetheless, they stayed the course and remained devoted to the marginalized people within their society. They were faithful throughout many generations. Again we can see that God did not place this calling on only a few specific people. We are all asked as the body of Christ to become engaged. It should be a natural part of our lives when we grow towards becoming “God’s people, in God’s world.” God’s intent for the body of Christ as the church is best positioned to meet these needs. That is why World Orphans is so convinced that caring for orphans through the local church is an effective strategy. We need to be in this together, as a community whose focus and determination does not waver. And please be encouraged that the church is stepping up to the plate more and more each day. The Barna Group recently did a research project that shows that churches are becoming more passionate about the orphan crisis. In fact, Christians are adopting twice as often as the average person and it is Christians who are more likely to take action within the foster care system and in aiding vulnerable children all over the world. This is very encouraging! Now come the hard questions we must discuss: How are we participating within our communities of believers to address orphan care? Do you see local churches in your area moving toward a direction of action? Specifically, how is your church engaged? 1- Pirkei Avot is usually translated as "Ethics of our Fathers.” It is a compilation of the Torah's ethical teachings and maxims as interpreted by the Rabbis of the Mishnaic period. It is included in the Mishnah.